Most all animals, pets, and unwanted pests alike love RVs. And, why not? They are a shelter from the outside elements. RVs are usually more temperate than the outside. They are dry and dark usually with plenty of places to hide. Pets are invited guests, while other pests are not as welcome. If you like to go RVing with your pets there are a few things you might need to know before you hit the road with them. Also, you might want to consider a few things to keep your RV pest-free, especially before or after you store your RV for the winter. Pets can be great travel companions. But, in such small spaces, sometimes our pets can get in trouble with the common things we have lying around. If your pets are not great at heeding commands or the word "no," then, there are a few hacks you can use to curb your kitty or pooch from unwanted behaviors. If you have a cat that is scratching your furniture, carpet, or curtains, or perhaps using an area of the RV as a litter box, get cayenne powder and sprinkle it generously everywhere you want your cat to avoid. It's natural. It's inexpensive. And, it's effective. Your kitty does not want cayenne up her nose or on her paws. The downside is that it's bright red and obvious, but it does not stain, and it gradually disappears. If you have a dog, particularly a puppy with a bad chewing habit, and you are afraid of the dog chewing your electrical wires, similar to the cayenne powder, get some hot pepper sauce and dab it on electrical cords that you want your dog to bypass. Dogs have a keen sense of smell. A run-in with hot sauce is not something your dog will want to experience. Ideally, you do not want creepy critters infesting your RV. An ounce of prevention is worth a pound of cure. Work on critter proofing your space and keep it clean. The extra things you do may help prevent an invasion. Perhaps the biggest tip is to not leave any food lying around, exposed. Seal food in airtight bags or containers. Rodents, roaches, ants, and most all insects are attracted to an easy source of food. Make sure to eat your fruit before it attracts fruit flies. To prevent bugs, spray insect repellent on doors, windows, or work areas, (for example, wipe some around the edge of a laptop computer). You can place a couple dryer sheets in your food cupboards and clothing drawers. Spiders and other insects are put off by the fragrance. It can be a win-win situation. Bug-free and clothes will smell good, too. To prevent ants from invading your home away from home, sprinkle powder around your tires, landing gear, or anything that touches the ground. Ants do not seem to like anything powdery. Baby powder, talcum powder, or chalk are very cheap deterrents against ants. Ants usually will not cross that powder line. 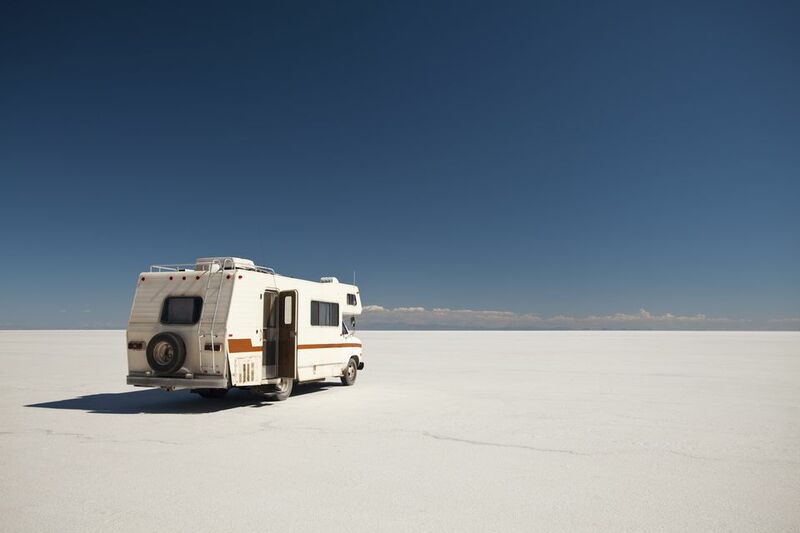 If you develop an ant or roach problem, use Borax or boric acid powder and sprinkle lines of it around your RV. Ants and cockroaches will carry the powder back to their nests, which may eventually kill off the nest. Another repellent, mothballs, which are made to repel moths and silverfish, may also be effective against snakes, scorpions, spiders, and mice. Although, the Environmental Protection Agency warns against the use of mothballs for anything other than what it was intended. Weigh the use of mothballs carefully. You may want to steer clear of them entirely if you have pets or small children around the RV. Mothballs, if ingested, are highly toxic and potentially lethal. Also, mothballs give off a very strong scent that can permeate clothes and the RV and last for months. If you get a bee, hornet, or yellowjacket stuck in your RV do not try to shoo it away. An agitated bug with a stinger is the last thing you may want around you or your children. In this case, you can use a spray bottle of really soapy water to kill the bug. Dish or laundry detergent are your better choices for super-soapiness. In some states, this is the only approved way to kill these bugs. If you get a hive or nest in your RV, you can pour soapy water into a nest to kill the entire nest. Snakes hang out where they can hide. Bushy areas, woodpiles, tall grass, or any area that provides shelter and camouflage can conceal one or more snakes. They may come out to sun themselves and later find shelter somewhere in or around your RV. For this reason, keep your RV doors and windows closed at all times. Snakes eat insects, rodents, small animals, birds, or whatever they can catch. If you are parked near these kinds of snake habitats, use caution when digging around outside. Look carefully, perhaps poke around with a long stick in a dark or enclosed area. Do not use your hand in dark areas if you cannot see all the way into ​the space. Who is the most reliable RV maker? Is a Camping Honeymoon Right for You?